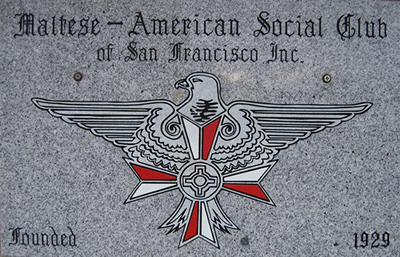 Towards the end of November 1929, thirty-five Maltese residents of San Francisco met to discuss the establishment of a Colonial Club. A committee was given the task of finding suitable premises for a meeting place. In January 1930, they rented the ground floor of a house at 1648 Oakdale Avenue, San Francisco. That same month, a committee selected the first officers of the club: F. Grech, President; C. Fenech, Vice-President; E. Micallef, Secretary; J. Azzopardi, Treasurer; C. Scicluna, Assistant Secretary; and R. Deguara, Assistant Teasurer. Hence, the “Maltese Club of San Francisco” was given birth. Very soon after, the “Melita Soccer Football Team” decided to join the Maltese Club, doubling the Club’s membership. In 1932, the “Sons of Malta Soccer Team”, as the Club’s team was now called, won the Redmen Convention trophy in Santa Cruz. Other Club members who were musically talented organized a jazz band which played at dances and picnics and even gave concerts. This “San Francisco Maltese Band” even played for the welcome of Archbishop Edward Hanna at his dedication of the St. Paul of the Shipwreck Church auditorium. A dramatic company was also formed under Club auspices. This group put on plays in Maltese for the entertainment of the Club’s members and their families. The Club’s activities encouraged many other Maltese to enroll, so bigger premises became an indispensable necessity. In June 1931, the committee rented the large building at 1789 Oakdale Avenue, a former church. The Club eventually bought the property, which remained its headquarters until 1995, when the Oakdale building was sold and the Club’s present premises at 924 El Camino Real in South San Francisco became the Club’s new home. Although the soccer team and dramatic group no longer exist, the Club continues to be a source of entertainment and community to new generations of Maltese-Americans. Dinner-dances, casino trips, children’s Christmas parties, and other events draw members and guests from all over the Bay Area to the Club. With the addition of women as full-fledged members in the 1990’s, mystery trips, bingo nights, pot-luck dinners, and knitting groups have been added to the list of the Club activities. In addition, a Melitensia library has been added, providing books, music, and films on a variety of aspects of Maltese history and culture. The Club celebrated its 50th anniversary at its Oakdale premises in San Francisco in May 1979. Joseph Grech, Jr. was president at the time. San Francisco Mayor Dianne Feinstein was the guest of honor. Twenty-five years later, led by President Joseph Tanti, the Club celebrated the biggest event it has ever had. This 75th anniversary celebration was held on October 2, 2004 at the South San Francisco Convention Center and featured the Nicolo Isouard Band of Mosta. One can only guess how a new generation of Maltese-Americans will celebrate the Club’s 100th anniversary in 2029! © Copyright 2014. 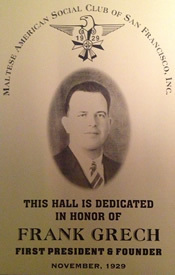 Copyright Maltese-American Social Club of San Francisco All rights reserved.